Permanent waterproofing system ideal for basements, cellars, pools, and below ground applications. Can be used on walls and floors in shower and bathrooms. Can be brushed or spray applied. 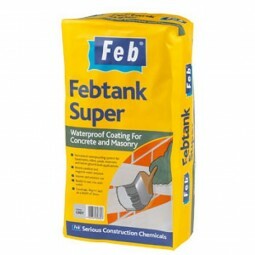 Can be applied over damp substrates. Resists positive and negative water pressure. Can be used interior and exterior use and be covered with a decorative finish or left uncovered. Just mix with clean water. Coverage 3kg per metre squared at a depth of 3mm.